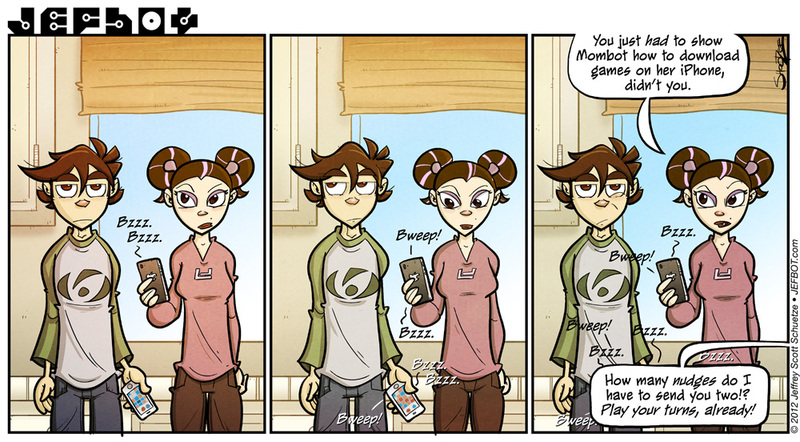 So are you gaming with your parents/siblings via your smartphone or tablet? Letterpress? Words With Friends? Scramble? Bejeweled Blitz? Sound off in the comments! • Check out the Cereal poll and vote, if you haven’t already! • Check out the NEW BOTshop for all your holiday shopping needs! Thankfully no one in my family owns smartphones. We have regular ol’ only for makin’ phone calls cell phones. I just can’t see the point of having a “lpatop” for a phone. I rather use my laptop! Really pointless. By the way, Mr. Jeffbot. Read about your job situation and hope things turn out good in your new adventures. But… I do confess that I have NO idea what a multimedia designer is! What you eat that with?!!! Is that the same of a graphic designer? What is the freakin’ difference anyway?!! And for the record… you still owe me that video explaining how in the world you sketch and ink in Photoshop your comic!!! glad you got an LOL out of this one, JCB! and it’s probably best for the sake of your family that you don’t have smartphone games to compete with each other over. heheh. and thanks for the job sitch sympathy. a multimedia designer’s kinda like a graphic designer, but in addition to creating graphics, i did animation and programming (mostly in Flash) in addition to getting training courses working on Learning Management Systems via SCORM (a standard for LMS and eLearning courses.) now that i have the time, i’ll be able to make that video, most likely! Oh my… HEAVENS!!!! I got a FIRST?! I wasn’t even trying since is so difficult with the rabid fanbase you have that fight to the death to become the first comment of the new comics! I can die happy now! heheh. yeah, the Shades are somewhat difficult to obtain, JCB. congrats! heheh. you’d fit right in, DAS! i get so many requests from friends to play new games every day, it’s ridiculous. and yeah – so far Mombot doesn’t have Bejeweled or Solitaire, two of her favorite games. it’ll be interesting when that goes down. heheh. Words with friends with my mom and she kills me all the time. So yeah, my mom now takes it easy on me when playing Words with Friends. I don’t do much phone gaming with my family any more. I prefer doing it old school with a family game night. Preferably Apples to Apples and Monopoly. good games, 52pickup! and easier to close up and walk away from when the games are over. My mother-in-law is obsessed with Bookworm, but she’s never played competitively. I don’t know if it even has a multiplayer mode. I used to compete with my mother-in-law to see who could set the record for longest word. I thought I was doing good when I hit 14. Her best at the time was 17 with — in her own words — no Q’s, no plurals, and no superlatives. Mine was a plural 1 Q-word. No hope of competing! But yeah, I haven’t played in a few years either. I’m trying to make a living writing novels, so I want to get away from making words when I play games! heh. yeah, it’s still a bit surprising every time i get a text from my mom, steve. i haven’t played Hanging with Friends, GG11 – i’ll hafta look that up later. yep! and yep! problem is, animation’s just SOOOO time consuming, and i just don’t have time at the moment, even though i’m dedicating nearly all my time to JEFbot. but i’m thinking about taking a day to make a short test, just to see how much potential’s there. when i do it, i’ll be sure to post it in the jefBLOG, but it won’t be for a while. glad to hear you’d be interested! I have yet to even try and get any games on my smart phone. It’s mostly because I’m lazy and would rather be playing on an actual console, but also because I don’t want to get sucked into some of those games. Yeah, I keep myself occupied enough with The Escapist, YouTube, and web comics. Don’t need even more distractions. I was just wondering, there is JefBot, mombot and popbot. Not going to ask how that happened, but why are there no more “bot”s in your family, or was it just something that seemed to have coincided with the three of you? i’m so afraid to get into the “‘ville” types of games. i’ve been playing DragonVale, Hot Springs Story and Epic Astro Story sims for longer than i’d like to admit, and they’re close enough. I’m a Words with Friends addict but so far my parents have resisted my invitations. Just as well–Mom does words games and Sudoku in pen and would absolutely smoke me. And Dad would play a word a week . . .
i’m thinking about getting my mom into WwF, Sarah W, but she’s actually really good at Letterpress (don’t tell her i said that) and i’m afraid of being “smoked” myself! And so great to see Lor in a comic, we haven’t seen her in a while. While Mama Pixie and I don’t play games on our phones together, the texts get ridonkulous! And she gets on me if I misspell something. Mom is not a fan of cell phones while I am visiting with her anyway. Everything goes on silent. Daddy Pixie doesn’t even text on his phone! It’s weird! My dad and I play chess a lot with our iPhones, though apparently if I beat him one more time he’s quitting.. He beat me for 20 years at chess, but he can’t stand losing himself, it’s funny. Words with friends with my sister, and my mother and I just text.. Or send photos all day. Though I kind of miss sitting down and actually playing chess on a real board. My phone… I can make calls, and send messages. I know this makes me sound as old as dirt but what I want out of my phone is it to work, and work good. Thing is, I have this seven year old phone that is held together by duct tape because… well if it was good enough for me to stick in a sock and bludgeon a guy who snuck into my house to rob the place with then it is good enough to keep in shape as best I can… but as I was saying while my friends are holding their smart phones up to the sky trying to get a signal when we are out far from town I am looking at mine and saying “Huh… full bars.”… at which point they glare at me since we all have the same provider. Just saying. High tech isn’t always what it is cracked up to be. Reminds me of the joke that an iPad is just an iPhone for the visually impaired and/or fat-fingered, since they’re both equally effective at making calls w/o Skype. I cant tell who is more pissed at Jefbot right now – Bot or Lor. Oh, and regarding the cyberyore throwback, I explained defragging to my dad — who’s a professional chef — as trying to make a salad with the ingredients scattered all over the house vs everything being in the crisper drawer. Made perfect sense to him, and his computer knowledge goes as far as playing Jimmy Buffett podcasts. Heh heh… since I tossed all my discretionary for the next.. um… two years on a Mac Pro last nov… no smartphone for the likes of me. I have am LG reflex… it’s merely clever. I think I want to start a carrier…..
FÖN Celluar. – It Just Makes Calls. Dumb Phones for Smart Users. Your mom is too cute. xD I’m glad she’s getting tech savy!! Maybe she can get my mom into it, it would be so much easier if she actually could just open up a text. How many licks does it take to get to the center of a Tootsie Roll Pop? The world may never know. Knowing that board games are better played in table top format when more than one player is in the house. . Priceless. or else you’ll get Jefbot’s eyeball aches. The expressions on your faces are awesome. I love it! No, I haven’t started any of the interactive/multi-player games, although some of them do sound fun. Look up The Curse. Fun app to kill time. Also slightly creepy.